Today is the last day of my cosi swimsuit tour! I have been so impressed and happy to see all the gorgeous swimsuits that my guests have made. Thanks guys!! Today, Sarah from EmmyLouBeeDoo and Heidi from Handmade Frenzy. Sarah from EmmyLouBeeDoo was one of my biggest supporters when I first decided to create this pattern. After I invited her on my tour, she emailed back the next day saying she had ordered all her fabrics and that she couldn't wait to start sewing. Sarah herself is a successful indie pattern designer. She has released four PDF patterns to date - the doli tank, hosh pants, bimaa sweater and her new shandlin tank. You can check out all of Sarah's designs in her etsy shop. You can see more of Sarah's galactic cosi over at EmmyLouBeeDoo. Thank you Sarah! Heidi from Handmade Frenzy was one of my cosi testers. She made a super cute cosi during testing and has sewn up another one for my tour. Heidi has been having fun with photography lately and her photos keep getting better and better. How cute is her daughter in this polka dotted cosi? Heidi sews for her son and daughter and also for herself. 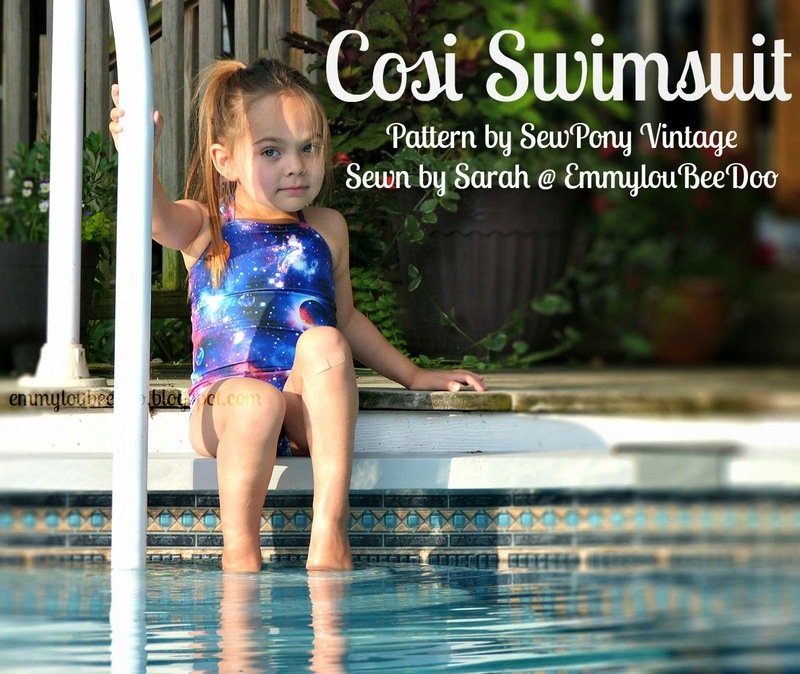 To see more of her polka dotted cosi, head over to Handmade Frenzy. Thank you Heidi! You can buy my pattern here. Until tomorrow you can receive 15% off with code: COSITOUR15 at checkout. Thank you so much to all my lovely guests for sewing up and promoting my pattern. I have loved all of your cosis!!!! Rachel, Helena, Ana Sofia, Trine, Heidi, Hayley, Jess, Marta, Isabelle, Rebekah, Suzanne, Sarah, Jess, Jane, Jenya, Renee, Stacey, Olga and Karly - THANK YOU!! I've enjoyed this tour so much, Suz! So much great inspiration! <3 Thanks for creating such an awesome pattern!